Did you have an imaginary friend when you were little? It's great to have a buddy that's at your beck and call. It can be so nice to have an invisible playdate that you can blame for trouble around the house. No, you didn't break that vase, your little friend did it. Well, yes, you ate the ice cream sandwiches but it wasn't your idea, it was your imaginary friend's idea! Born out of the stuff of nightmares, this frightening character has been creeping out both young and old for a while now! 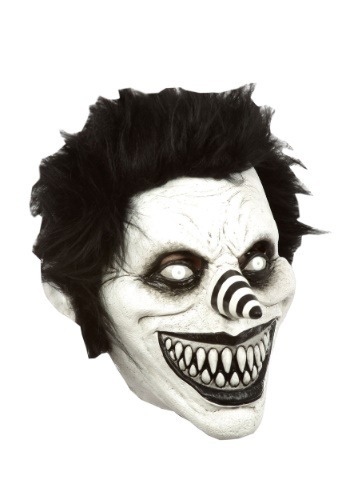 This is a flexible material with a giant smile, dramatic coned nose, and faded white eyes with slots for sight within the black liner, and a shaggy head of hair. The black and white mask can be paired with a fitted white and black long-sleeved shirt and a bag of hard candies to make your look complete. Not many people can avoid the fear that comes with this scary mask. Just remember to practice your cackle!